White paper on crime 2004 Part4/Chapter2/Section6/6. Fig. 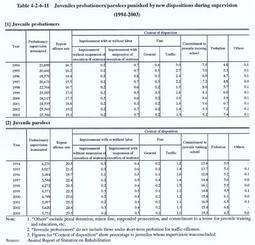 4-2-6-9 shows a breakdown of the occupation of those juvenile probationers(excluding those on short-term probation for traffic offenses;hereinafter the same in this section)and juvenile parolees whose supervisions were concluded in the last10years.During this period,the percentage of employed has decreased,while that of unemployed and pupils/students has increased among both probationers and parolees. It is not necessarily appropriate to compare the juveniles newly placed under supervision in2003( Fig. 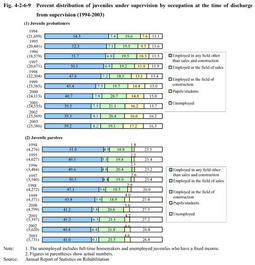 4-2-6-6 )with those discharged from supervision in the same year,since these two groups consist of different juveniles.However,if the comparison is made only to obtain a rough idea on how much the employment of juveniles had improved under supervision,it revealed that the percentage of unemployed was lower among those discharged from supervision than those newly placed under supervision. Fig. 4-2-6-10 shows the percent distribution of juvenile probationers and parolees by reason of their concluded supervision in the last10years.The juvenile probationers whose supervision was early discharged from probation for good-conduct accounted for75.6%or about three quarters in2003. On the other hand,the juvenile parolees whose supervision was early discharged from supervision for good-conduct accounted for18.8%in2003,the expiration of term accounted for64.8%,while those who were put back to juvenile training schools or a revocation of protective measures accounted for16.1%,without much change in the last10years. 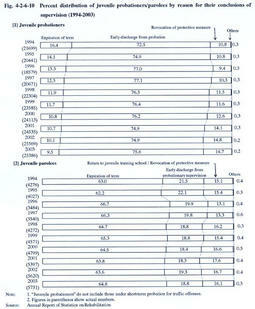 Table 4-2-6-11 shows the percentage of those juvenile probationers/parolees who were punished again by new protective measures(excluding return to juvenile training school)or by criminal dispositions due to repeating crimes or delinquent acts during their supervision among those whose supervision was concluded,in the last10years. The percentage had mostly declined until1996among both probationers and parolees.Since1997,as far as juvenile probationers are concerned,it has slightly increased,to19.1%in2003.On the other hand,as for juvenile parolees,it went fluctuated during the entire period,coming to23.5%in2003,down0.9points from the previous year. Local delinquent group: Local delinquent group means a group of juveniles who have a common delinquent culture,which is formed mostly by juveniles living in the same area.They might go to different schools and workplaces.The famous examples are"color gangs"and"teams"in which juveniles wearing the same clothes loiter in a group.Compared to bosozoku,the groups do not have any specific organizational goals,and therefore are not firmly organized.However,they do commit such crimes as bag-snatching theft,extortion,and robbery etc.in some cases. Revocation of protective measure: A protective measure is taken not on a case of delinquent incident but on a person.Thus,only one protective measure is taken for one juvenile in principle.Therefore,if a juvenile under a protective measure performs another delinquent act and a family court takes another protective measure on the juvenile based upon another delinquent act,the court may revoke the prior protective measure(or the subsequent protective measure in some cases).A family court may also revoke a protective measure when the juvenile is convicted in a criminal court.